News of the Saudi Crown Prince Sultan passing in the U.S. and his new successor to the post warrant a refresher on the attempts to name them in 9/11 lawsuits years ago. Photo, right: “Bandar Bush” and Condoleezza Rice join the Saudi King and Bush at Bush’s Texas property. 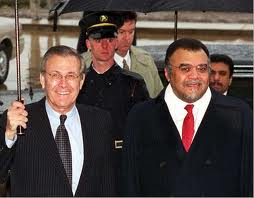 ….Clarke offers an incendiary theory that, if true, would rewrite the history of the 9/11 attacks, suggesting that the CIA intentionally withheld information from the White House and FBI in 2000 and 2001 that two Saudi-born terrorists were on U.S. soil–terrorists who went on to become suicide hijackers on 9/11. Clarke’s theory addresses a central, enduring mystery about the 9/11 attacks– why the CIA failed for so long to tell the White House and senior officials at the FBI that the agency was aware that two Al Qaeda terrorists had arrived in the United States in January 2000, just days after attending a terrorist summit meeting in Malaysia that the CIA had secretly monitored. He said that if he had known anything about Hazmi and Mihdhar even days before 9/11, he would have ordered an immediate manhunt to find them–and that it would have succeeded, possibly disrupting the 9/11 plot. Grossi said Tampa police intelligence detectives called him about 11 a.m. Sept. 13, needing help with a special situation: They had been watching three young Saudi men — at least one a student at the University of Tampa — at their south Tampa apartment, and the trio was scared and wanted to go home. Apparently arriving in the country “weeks before the attacks,” the son and two other Saudis were living an hour away from Sarasota in Tampa Bay, Florida. It is reported that they had come to the U.S. in order to learn English — and wanted to leave after 9/11 because they felt it was unsafe for them to stay. Close to 140 Saudis, a couple of dozen of which were bin Laden relatives, were reported to have been flown out of the country without heavy scrutiny or questioning by the FBI. This was during the unprecedented grounding of all flights nationwide following the attacks. Diplomatic Immunity was going to keep the Prince and others from answering too many questions. The executive branch of the US Government could have had a say in moving around the Diplomatic status, and it could have done so in the name of “public interest.” Seeing that the Bush’s good family friends law firm Baker Botts was defending the Prince in Court, it was not likely to happen that Bush would move the Immunity to prosecute the Prince — even if the public was interested.